While attending culinary school in Vancouver, one of the local haunts that us students would unwind at, was a bar called the Two Parrots Perch & Grill. Through the foggy memories of gin soaked nights out with friends, it is the nachos that I remember best. Hands down the best nachos I had ever had. I suggest heading over there for a cold one and a hot mess of cheese-laden chips, but if you live a plane ride away, like I do, this is the next best thing. 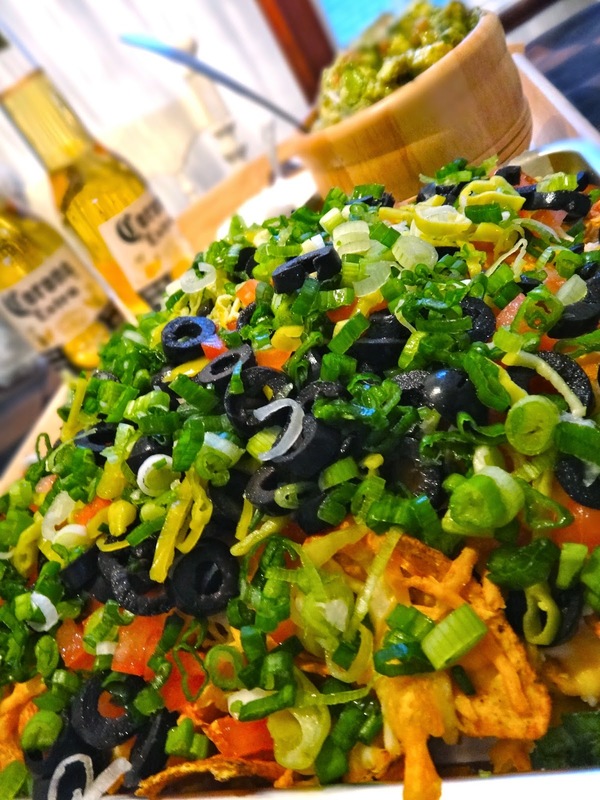 The trick to making these nachos super sinful, is layering the chips and cheese to ensure a perfect ratio. Preheat oven to 375 F. Line a large shallow casserole dish with parchment paper. Mix all the cheeses together. Layer chips and cheese, evenly, in the dish finishing with a full layer of cheese. Bake the nachos for 15 to 20 minutes or until cheese is bubbling and melted and tortilla chips start to brown. Remove from oven and begin layering the toppings starting with olives, then tomatoes, then peppers and finishing with green onions and coriander. Serve with your favourite dip and lots of beer and blushing white peach sangria.